Smart speakers from Amazon Alexa and Google Home have burst on the scene with a velocity and pervasiveness that is nearly unprecedented in the history of consumer electronics. Their rise from strange and novel gadget to near ubiquity in 2018 has been driven by their multi-function usefulness and reasonable price. A new report from our friends at Edison Research includes many remarkable findings about smart speakers in 2018 that spotlight the inexorable march of these devices into our living rooms and collective consciousness. 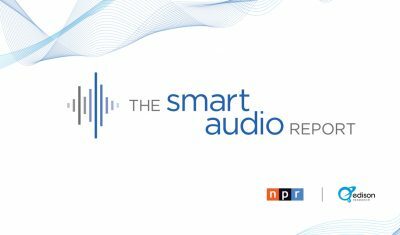 I scoured the 2018 Smart Audio Report from Edison (in conjunction with National Public Radio) and found these highlights: the 15 key statistics about smart speakers in 2018. This is more people than live in California, and represents 18% of the adult population. Netflix has more than twice as many subscribers as there are smart speaker owners, but reaching near 20% penetration with any consumer electronic is a major feat, especially in a very short period of time. Perhaps more so than any technology device, smart speaker ownership has been embraced by Americans in all generations. Ownership rates for these devices are nearly equivalent among people 25, 35, 45, or 55 years old. 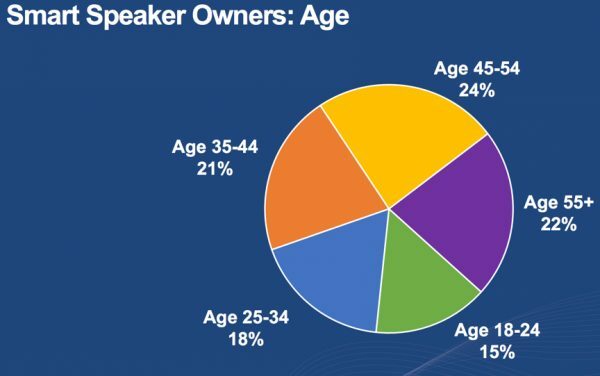 Currently, 54% of all smart speaker owners are women. The Smart Audio report found that 3/4 of all smart speaker owners have owned their device for less than one year, with the balance (26%) falling into the first adopters category, and owning their Amazon Alexa or Google Home for more than 12 months. One of the most interesting findings in this report is that 48% of the first adopters (have owned a smart speaker for longer than one year) use the device more often now than they did in the first month of ownership. This is even more pronounced among the newer buyers, 54% of whom say they use their smart speaker more today than they did in month one. Fundamentally, this speaks to the broad functionality of these consumer electronics, and owners’ appetite for discovering new ways to utilize smart speakers in their day-to-day lives. Nearly 50% of Americans who own a smart speaker own two or more of these devices. And among owners who have had a smart speaker for more than one year, 27% of them now own three or more units. While sources of audio listening are broad and varied, including laptops, AM/FM radio, smartphones, car stereo and more, it is remarkable that among people who have owned a smart speaker longer than one year, these devices are where they listen to audio most often. This is not the case among newer owners of smart speakers, which further underscores the finding in this Smart Audio report that as owners get more time with these devices they use them more, and in more ways. Among newer (less than one year) owners of smart speakers, 39% of this group listen to podcasts on these devices at least once per week. And a whopping 70% of this group have listened to a podcast at some point via their Amazon Alexa or Google Home unit. For years, the growth of podcasts (see our key 2018 podcast statistics here) has been steady, but without a true breakout moment. The theory has long been that one of the things holding podcasts back has been the relatively fussy need to have a podcast app on your phone or laptop or car and then find or “discover” good shows worth your time. This new report from Edison Research suggests that smart speakers may fix this deficiency. 74% of smart speaker owners who listen to podcasts do so directly from the device, meaning they say “Alexa, play the Social Pros Podcast” (my show). That’s as easy as it gets, and could usher in a new era of even greater podcast consumption. 65% of new smart speaker owners say they don’t know enough about what the device can do. Every second there is some new tool, recipe, or voice command with which your smart speaker can interact. I get a regular email from Amazon with updates, but that’s like drinking out of a swimming pool with a straw. There needs to be a better way to figure out how to maximize the utility of smart speakers. Will we see yesterday’s home theater installation companies become smart speaker optimizers? Other than maybe television, smart speakers may be the most widely used consumer technology ever devised. 73% of owners report that their children living at home make use of their Amazon Alexa or Google Home unit. We haven’t seen a tremendous amount of advertising about these devices, because advertising is mostly unnecessary. The people who already own smart speakers are propelling the next wave of adoption, either through word of mouth, or via gift-giving. 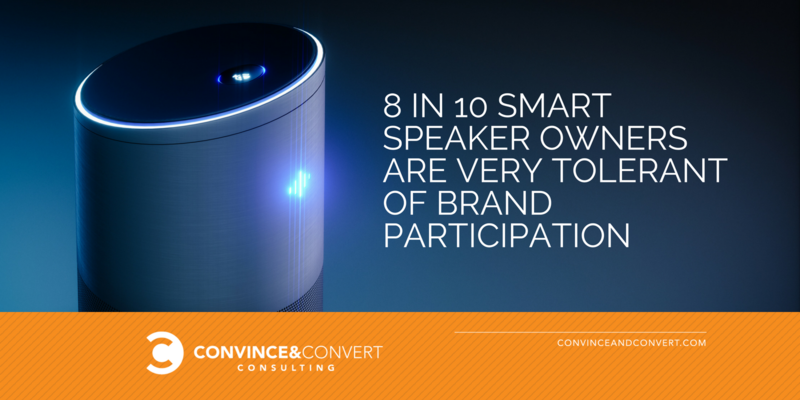 In fact, 61% of new smart speaker owners have encouraged their friends to purchase a device. Once you go voice, you never go back. Among new smart speaker owners (less than one year), 56% of this group has also begun using the voice assistant on their smartphone more often. This points to the very real possibility that smart speakers not only will become the primary audio device, but also the primary information retrieval and entertainment hubs for millions of Americans. One of my favorite data points in this Smart Audio Report is the finding that 8 in 10 smart speaker owners are open to skills and features created by brands. Compare this to the 49% of Americans that follow at least one brand Facebook page, and you find that users of smart speakers in 2018 are much more interested (for now) in interacting with brands in this capacity. 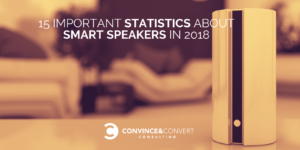 There you have it: my 15 favorite smart speaker statistics in 2018. I very much recommend you download the entire report from Edison Research and NPR (no cost). There is a LOT more information available. What I take away from this research is that smart speakers are growing faster, being used more, being used in more ways, and are a bigger threat to other media types than I thought previously.